I want to blow his pictures up big to make a bright statement in this dark hallway. And I want to hang some picture lights above his work to brighten this dark narrow space up too. Here's a couple of Williams drawings that I love. I might just buy a poster board and let me go at it, instead of having them blown up....better quality and inexpensive! I want to get gold lights....they are classic and wouldn't get lost in the dark wall. 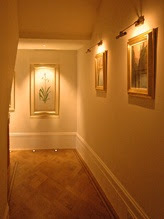 These will be such a nice touch especially at night walking down this hallway. Still finishing the kitchen, we are determined to finish before we finish something else or start something new! Boundaries are a great thing for young and old! !